Chili mac, when are you comin’ back? Are you familiar with chili mac? According to Jane and Michael Stern’s book “Road Food,” it’s a Midwestern specialty: spaghetti noodles topped with chili. Here’s what you get: a soup bowl filled with spaghetti and chili (no beans), and, if you want ’em, cheddar and onions. I did. Adding to the silliness, on the side you get a package of oyster crackers, those small, six-sided crackers that come with chowder or chili but, um, rarely with spaghetti. Strange it may be, the platypus of entrees, but chili mac was actually pretty tasty. I cleaned my bowl. Anyone else ever tried this regional specialty, or another one of which most Californians would be unaware? * St. Louis also has a diner named after the dish, which I tried on a 2014 trip home. Good stuff. Back when Bob’s Big Boy was on Holt in Pomona, I’d order their spaghetti chili. Piled high with cheese and onions. Yum. That classic dish is still on their menu but sadly there are fewer Bob’s Big Boys around these days. When I was a kid, I used to get “chili size” at Bob’s Big Boy in West Covina (now torn down when the mall was expanded). It consisted of chili, noodles and a hamburger patty at the bottom. And they say kids eat bad now! Chili Mac with spaghetti? My mom (from Chicago) made it for us as kids, but always with Macaroni (thus the MAC). I guess it would be OK with spaghetti but then wouldn’t it be chiligetti or something? I remember that it was one of those favorite Pot Luck dishes whenever the neighbors got together. When I was much younger, I was a server at Bob’s Big Boy and we had a chili mac item on the menu. You could get it with or without a patty in it. And…it was topped with a slice of American cheese. Sounds somewhat disgusting, but my kids loved it…and still make it sometimes. This reminds me that I was driving on the I-10 westbound last week and the former Chevy’s in West Covina is being reopened as the aforementioned Bob’s Big Boy! Perhaps folks will have an opportunity to try chili mac out for themselves. I am not a fan but the people there rave about it! I’ll stick to Buffalo wings from the Anchor Bar in Buffalo, NY! Hi Dave…I owned La Piccoletta in Claremont for 25 years…1980-2005…and I think “chili mac” is a sin against nature (my nature anyway). Other than that I have always believed what others eat behind closed doors is their own business, so if you like it…enjoy. By the way the new Italian restaurant in Claremont La Parolaccia is pretty good, you should try a pizza there. Happy Thanksgiving. 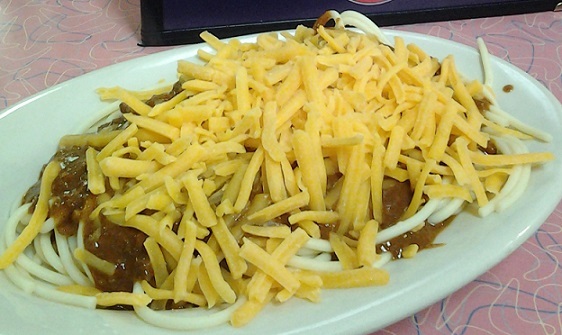 I loooooove Cincinnati chili, and Skyline in particular. That said, Cincinnati chili isn’t quite the same as chili mac/chilighetti. The former has a bizarre Greek genealogy and does not resemble any chili you ever had elsewhere. I grew up in El Monte and remember eating this at the counter of the local Thrifty’s Drug Store luncheonette. Loved it as a kid but it doesn’t sound too appetizing now. I agree with Ms. Biscardi that Chili Mac and its variants, such as “Cincinatti Chili” (with spaghetti + onions + cheese: so you can order it “2 Way,” “3 Way”), are abominations — definitely not chili. Especially with the Cincinatti version, the “chili” is something thinner and soupier that tastes more like spaghetti sauce than real chili. Another similar old-school diner/luncheonette item is the Chili Size — hamburger patty covered with chili (sometimes served like an open face “Sloppy Joe” on hamburger buns). The Midwest is the heartland and all, but it’s no place to order chili. You’re making me hungry! I love chili on spaghetti! I come from Savannah Ga. and grew up eating Brunswick stew, that and boiled peanuts are the two foods that I miss the most! Brunswick stew is my favorite comfort food. It’s a stew that is usually eaten with Southern BBQ. When I was growing up in Detroit, my mom used to make what she called quick spaghetti, same thing but made with macaroni. I still make it sometimes. Another uniquely Midwest/heartland specialty item that never successfully extended itself beyond the Midwest is the “made right” — a loose ground beef sandwich. I thought Maid-Rites were good, Dave, not quite sloppy joes…you’re right — they’re outta Iowa/Illinois, you might remember “Roseanne” the show, which took place in your stomping grounds, always referred to them. Bob’s (the oldest) Big Boy in Toluca Lake (fancy term for South Burbank) has chili spaghetti on the menu. Make the macaroni and cheese as you usually would, add the chili, cheese, sour cream, pepper and mix together. It’s damn good if I don’t mind saying so myself. Isn’t the twist to “Cincy” chili the addition of cinnamon as a spice component? I’m a fan of chili combinations in any form. Love the chili size. Those wonderful ladies at The Deli turn out a heart-clogging version for about $3. I told myself I wasn’t going to mix into this discussion, but now I feel the need (and have a spare moment). First, I agree with the person who said “chili mac” isn’t made with spaghetti, it’s made with macaroni. Spaghetti and chili is just that, although I have heard it called “Spaghetti Size” and “Texas Spaghetti.” My first memory of this was at Bob’s Big Boy, but I’ve seen it quite a few other places (and never as “chili mac”). And it always had a big slice of American cheese on top. Second, Cincinnati chili is to chili what canned spaghetti is to spaghetti. It may have a similar appearance, but that’s it. A very dear friend of mine is from Porkopolis (home of the flying pigs statue) and she assures me that Cincinnati chili is an “acquired taste” that even most residents of the Queen City never acquire! Third, there are a host of places that serve up a great Chili Size. Years ago the Marie Callendar’s in Claremont made a great Chili Size (ah, but no longer). The best usually are found at roadside burger joints that let the chili simmer all day so that it’s perfect about 11 o’clock at night. Finally, how about a “shout out” for what was the most popular lunch item in the high school cafeteria when I was in school (sooo many years ago). How many remember Chili Boats, which consisted of Fritos served in a paper tray or “boat” (thus the name) smothered with chili and topped with shredded cheddar cheese? Some places this was called “Fritos pie,” but that was served on a plate and usually included onions. Did this ever float in the Midwest, David? Chili mac, chili spaghetti and Fritos pie may sound strange but all things considered are actually pretty tasty, albeit unhealthy. Now, if you REALLY want to register big on the gag meter with a regional food, try scrapple… or lutefisk. We used to call your Fritos dish “Pepper Belly” when I went to Chino High… they served them in the actual Fritos bag, sliced open, and smothered with chili and cheese. Fritos are damn good with chili and cheese. Desdave, I also remember the “Pepper Belly’s from Chino High…that was so good on a cold day. Hey Dave, I finally made my way to Farmer’s Market in L.A. after attending the Auto Show and could not believe all the good food that they have there. I have to go a few more times so I can try everything they have in there. I used to go to a place near the bus stations in DC to get my “clili mac.” Spaghetti based and a bit hot. This was in the early ’60s.Then they moved to Alexandria,Va. D.C. used to have chili mac. My husband is constantly talking about it, since he used to buy it in D.C. Do you know the name of the place and where they moved to in VA?